I had a small camera and wanted to use it on the boom. 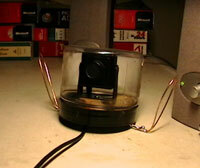 To make it weather proof, I mounted it inside a small jar. I placed it below the boom at first, but after a while I moved it above the boom, facing in the direction of propagation. 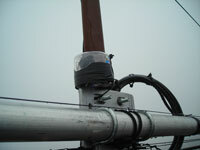 It gets its power from two unused conductors in the rotator cable. That meant I had to run only coax up the tower.